Click on it and see some fun pics of the people in my life. I hope you have fun. This is by far the strangest blog post yet but in an attempt to share more of my strange world with you I thought I would let you in on a conversation/debate I am having with my friend who shall remain nameless (we will call her Andrea) about the proper usage of undershirts for men. Please give your two cents and leave a comment. I don't care if you use a fake name to protect your identity....just play along! I happen to think that it is really gross when men wear nice button up shirts open halfway down their chest and no shirt underneath, which is very common here in South Florida I have noticed. Now guys, don't get offended if you do this. This is just a personal opinion!! I happen to think that if a guy is going to wear a nice shirt somewhat open, then he has to have a shirt underneath; otherwise its sleazy looking. My friend "Andrea" thinks that is it old fashioned to wear undershirts. And it is too hot to wear undershirts in SoFlo and in Latin America in general. I think that undershirts are not old fashioned, they are necessary and typify a classy guy who knows how to dress. What do you think? Are they necessary? Are they old fashioned? Are they classy? Are they for wife-beaters? Does it need to be the tank top kind or the t-shirt kind? Are they all goofy? Is it ever ok to wear just an undershirt? I know that in the end none of it matters, but I love a good debate between friends so I'm keeping it going. Bring it on!! We have more or less survived our first Florida summer. We moved to South Florida last year in October and everyone was telling us how hot it had been. Now I know what they mean! Its such a weird feeling for me to wish for the winter but its going to be so nice that I find myself thinking about how great it is that the winter will cool things down here in sunny Florida. Yesterday for the first time in awhile, Alex and I got to go to the beach. The rains held off for a couple of hours just long enough for us to stretch out and take a nap in the sand…..ahhh! For those who are not natives of Indiana, there is a song by that title that we sing at the Indy 500 race day. That piece of Indiana culture for you is free, on me, no charge. As we spent last weekend there again in Indianapolis, that song popped in my head. We love South Florida, but now I have a new appreciation for where I come from. Alex and I went to see family, friends, and churches in Indiana who have been kind and generous enough to help us begin this church in Pembroke Pines, FL. While we were there they truly welcomed us back home. 9. Walking through my parents’ pasture and woods with the first leaves of autumn beginning to fall. 7. Steak n Shake with our friends from Post Road Christian Church. Go Colts! 5. Alex taking pictures of the people at church from the stage on Sunday morning with his iphone! Cincinnati who drove up to see us. 3. Spending quality time with my parents, my sister and her kids…good for the heart. 2. Watching children and families from Central Christian Church bring the change they had saved up to give to The Pursuit to help us as we grow! And a very generous special offering on our behalf from everyone in the congregation to continue the work here. 1. Experiencing the generosity, kindness, and concern of the people who have sent us in faith to serve God in South Florida. Today is a reason to celebrate. Today I looked around at all the people helping set up for our first service in our new venue, and I remembered our first services at the beginning of the year. Already I see how God has multiplied our numbers according to his grace. We were not alone today in our work to prepare for the weekend celebration. I stood in a circle with at least fifteen people hand in hand praying for the service before people arrived as the band practiced and others will still preparing. I The circle of people committed to upholding the vision the Lord has for The Pursuit is growing beyond just a small group of people from Indiana and Venezuela. Its bigger than us. Its God-sized and God is doing his amazing thing that he does. We thank God for each special person he has brought to The Pursuit. We seek only to be faithful and trust that God will continue to do great things among us. 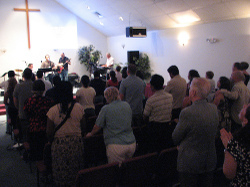 To see photos of our new venue, another blessing from God, go to www.mattmehaffey.com and enjoy! 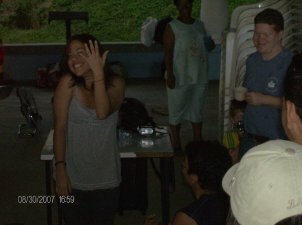 As many of you know Alex and I met through my travels to Venezuela. During my time there we worked with the youth group there. Now the kids we worked with are all grown up and graduated from college and we just found out this week that two of them are getting married. 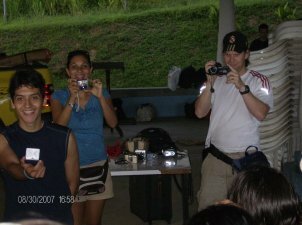 Our friend Luis asked his girlfriend of five years or more to marry him at this summer’s week of camp in front of all the others. I am so happy for them and I know that God has great plans for this couple who have based their relationship in their love for God. Congratulations you two and I expect a wedding invitation. Maybe you guys can get married at camp too!! I have taken something of a hiatus in the blogosphere. This has been for several reasons, but it is time that I begin to speak again. I am ready to fill you in on daily life in the church planting world and the things I encounter along the way. Thanks for your patience as I get myself reorganized and begin again. 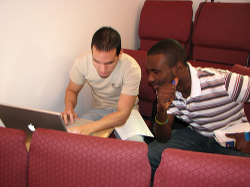 One thing I really love about church planting is the networking that takes place among new churches. I get to talk with others who have similar goals and plans in their cities all over the county about the similar challenges we face. I have learned so much from talking to one person specifically, which is Monica Nelson. Monica and her husband Mark were in campus ministry at Purdue when I was a student in campus ministry at Indiana University. 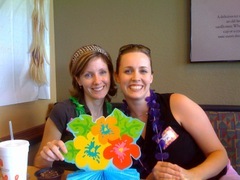 They are now planting a church in Knoxville, Tennessee where Monica leads children and groups like I do for The Pursuit. We are able to swap great ideas and laugh about the crazy things we do to pull off the work in all the different ministry areas we are in. I love that Monica loves what she does. She is someone I admire in her character as a woman in ministry as well as wife, a mother, and a friend. And I especially love that she is willing to take time out of her busy schedule to talk with me and coach me on areas where I need help. I find it so nice to know that we are all in this together and that the Church is bigger than the congregation that any one person attends on Sunday. God has so many people who seek to serve him all over the world and we share a common bond because of it. One of the people who have become very special to me is my friend and leader-in-training, Martiza Ceron. She came to the Pursuit already a Christ-Follower and brought people with her from day one. Maritza has now stepped into training to be a leader for our Student Community, and I get to meet weekly with her to talk about what it means to lead people in community. I love to see her enthusiasm and her willingness to do whatever it takes to become a leader God can use. The fruit of her labor to grow as a leader is already visible. 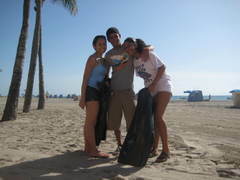 The day after Independence Day, Maritza took a couple of students at 6am to clean the beaches as a part of “We Love SoFlo.” She is quickly grasping the importance of relationships in her ministry to students and making remarkable sacrifices to show her love for them and desire for them to grow as they follow Christ. As I was getting ready for our friend and community group member Leslie’s Chick-fil-a luau, I realized I got rid of most of my Hawiian gear since I graduated from Indiana University! I was able to scrounge something together and go show support for Leslie along with Alex, Adriana, and Matt and Janie Mehaffey. And to boot, I won the hula hoop contest…..yep, I still got it! !